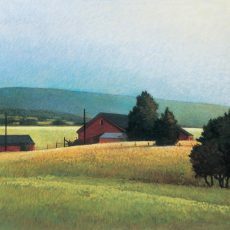 Wadlington, Sandy | Artists | Canadian Art Prints & Winn Devon Art Group Inc.
Those who appreciate the softly-painted and widely acclaimed landscapes of Sandy Wadlington find it easy to understand both her love for art and for the countryside that she paints. Her love of art began with finding tons of paper and boxes of pencils, crayons and paints under the Christmas tree each year as a child and is, fortunately, one she has never outgrown. 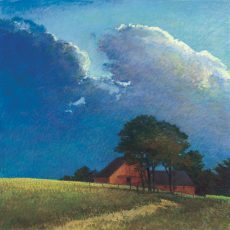 While Wadlington says there is no message in her art, that she simply tries to communicate the quintessential beauty that inspired it in the first place, her work certainly conveys a love for the countryside. Confirming this, Wadlington says that the simple yet sublime images of the countryside are indeed important to her. In her eyes nature in the form of mountains, water, sky, sunsets, light and trees should be revered in an almost religious sense. 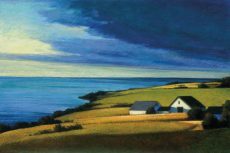 Her work has been exhibited in individual and group shows throughout the country, including the Marvin Seline Gallery, Houston, Texas; the San Antonio Art Institute, San Antonio, Texas; and the Texas Fine Arts Association, Austin, Texas. She was represented in six shows in Japan in 1993, and her work is included in many corporate collections. 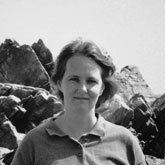 Wadlington was born and educated in Boston, but it was not until she married a Texan and moved willingly to Texas that she began to think clearly about the importance of the New England landscape in her art. 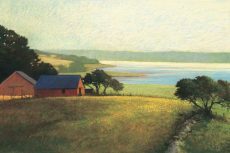 Influenced, too, by her great-great-great grandfather, Alvin Fisher, one of the Hudson River painters, she began to act on her desire to continue with the landscape tradition. 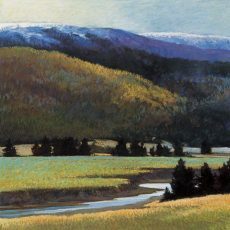 Says the artist: Inspirations come from the coastline and the mountains, all of which are near where I live. 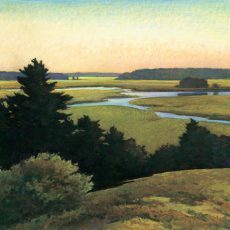 I try to focus on color as well as place – the strong sunlit coastal buildings in summer, the oranges of autumn against the distant blue, the subtle, colors of winter and spring. Mountains in winter, though often snow-covered, can have a warm, brilliant quality, which I find appealing.